One very important thing to consider when preparing to live in a van is temperature control. And the biggest factor in controlling your van’s temperature is insulation. A well-insulated van will stay cooler in the summer and warmer in the winter, and it will be easier to maintain a comfortable temperature. Construction of the van. 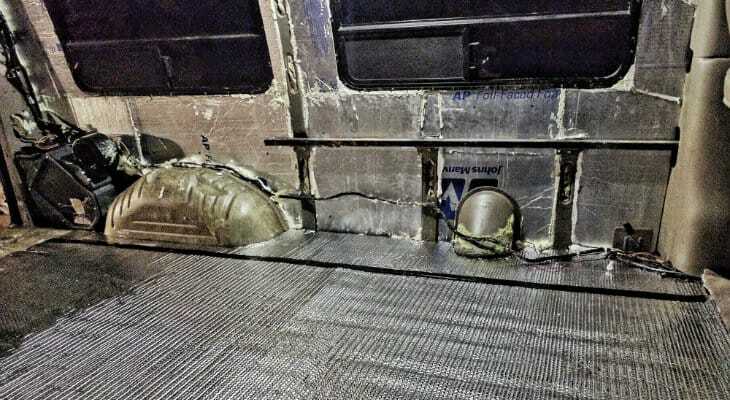 Our van body is single-wall sheet metal with metal ribs running up and down for support. It’s very curvy and kind of a pain at times. We wanted to insulate in a way that worked with our van and would also let us easily put walls over it. R-value per inch. Since a van is such a small space, every inch counts. We wanted to use material that would give us the highest amount of insulation with the lowest amount of thickness. Cost. We wanted our van well-insulated but we also did not want to spend extra money on stuff we didn’t need. 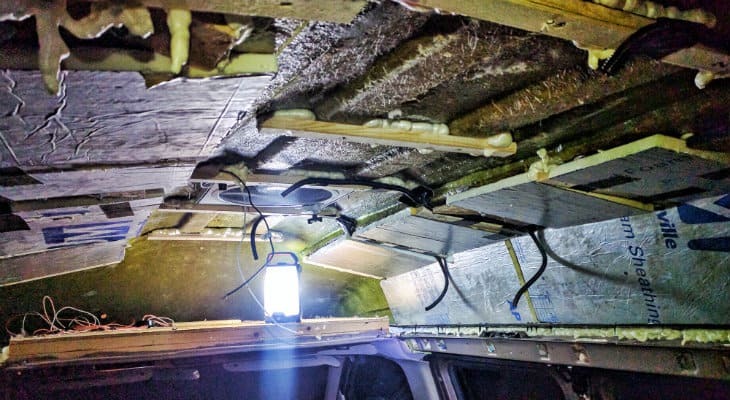 There’s a lot of information out there about insulating a van for van life, and there are a lot of different opinions on what’s the best method. 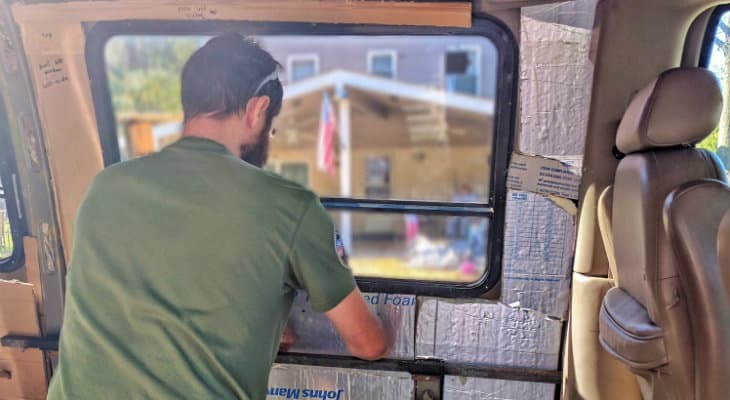 The post below shows you exactly how we insulated our van, and we highly recommend reading it. 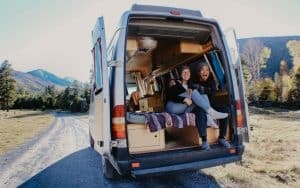 But if you’re looking for an in-depth guide, we’ve since published a detailed post about van build insulation that dives into everything you need to know. 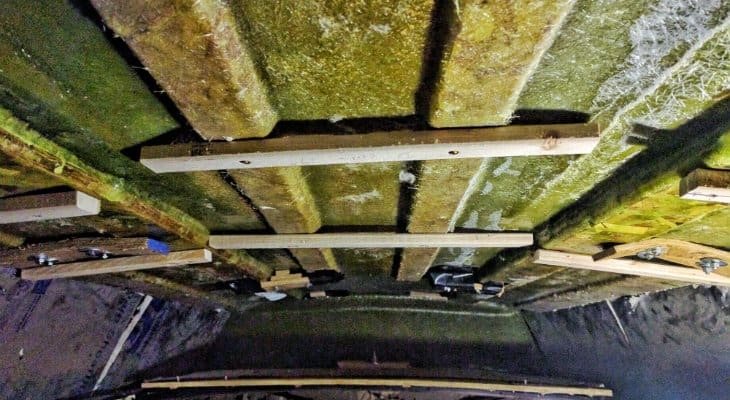 Based on our research, we decided to use a few different materials to insulate our van. Polyisio gave us the best “bang for the buck” in terms of R-value per inch. It has an impressive R-6 per inch of thickness, compared to R-2.2 for fiberglass and R-5 for polystyrene foam. The foil face can also add a slight barrier to radiant heat. 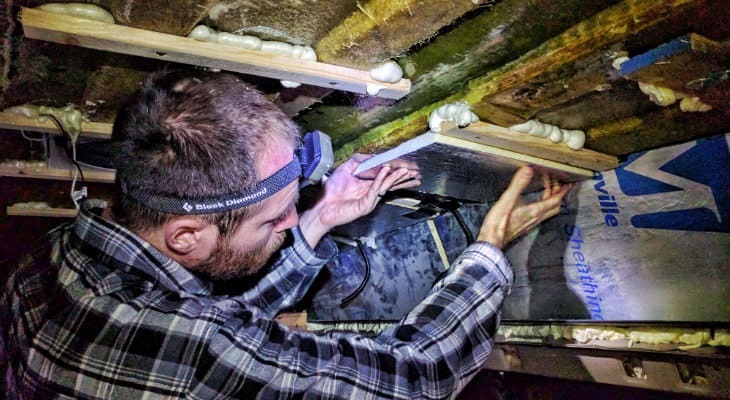 The 3/4” panels (R-4.4) fit perfectly flush with the ribs of our van body, so we would be able to screw the wall to the ribs right over the insulation. They didn’t carry Polyisio at Home Depot or Lowe’s in our area, but Menard’s had a bunch of it. Since we didn’t have the same thickness concerns with the door panels, we figured fiberglass insulation would be the easiest and give us the highest amount of R-value. 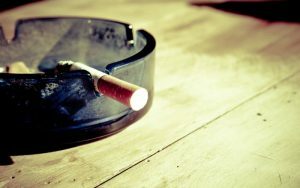 It also doesn’t get moldy or hold onto moisture like denim or cellulose insulation. It’s a really common piece of advice to use Reflectix as the backbone of insulating your van. 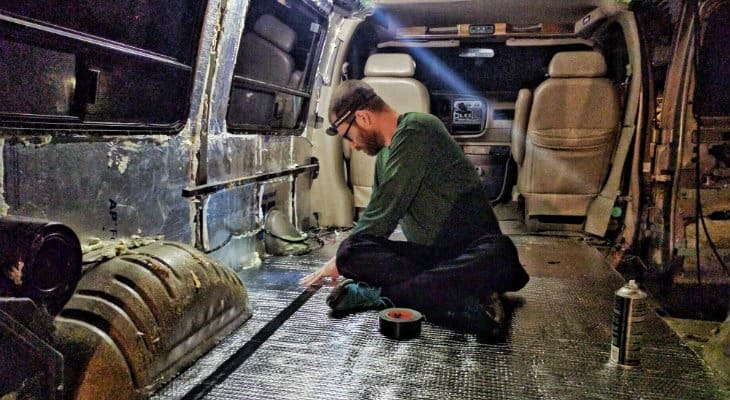 Many blogs and forums will tell you to line the entire inside of your van with Reflectix to create a radiant heat barrier, then put foam or fiberglass insulation directly on top of the Reflectix. The problem with this is that Reflectix needs an air gap to do its job. If there’s no air gap next to the Reflectix then it can’t reflect radiant heat, and its R-value is less than 1. This means that if Reflectix is used incorrectly, it doesn’t do a whole lot besides drain your wallet. Reflectix is great as window insulation because it will reflect the heat of the sun away from your van. 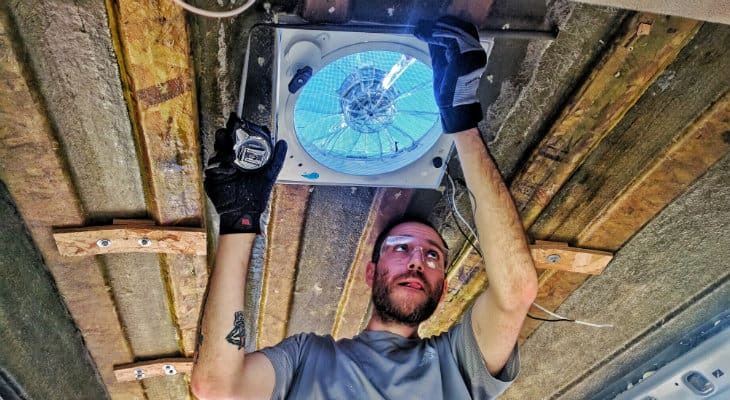 But for walls and ceilings, you’ll be better off and you’ll save a lot of money skipping the Reflectix and just using something like foam sheets. We did decide to use Reflectix to insulate our floor because it’s thinner than foam and we figured that something was better than nothing. 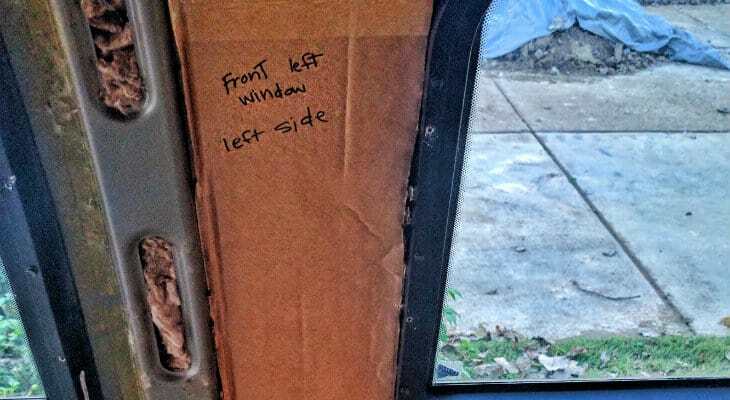 We bought your basic R-19 fiberglass insulation batts to insulate the doors and the framing of the van. The batts fit perfectly into the doors so there was no need to measure anything, and it stayed up pretty well without adhesive. We only had to use a little Gorilla tape here or there. The framing was a bit more tedious. 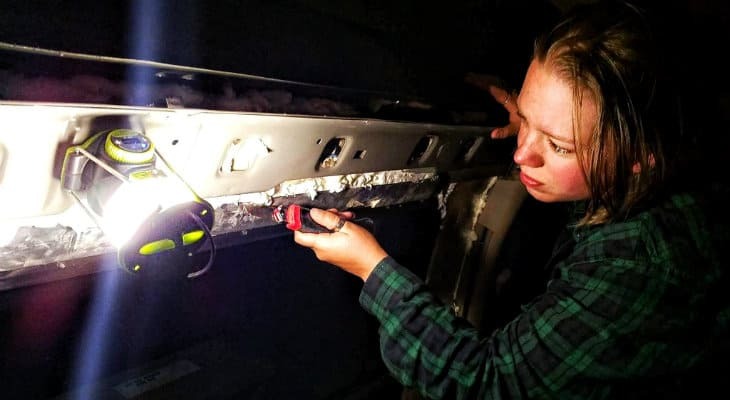 The metal “ribs” of our van are basically hollow, and we definitely wanted to get some insulation in there. For this, we cut the fiberglass batts into strips then used screwdrivers to jam it into the frame. 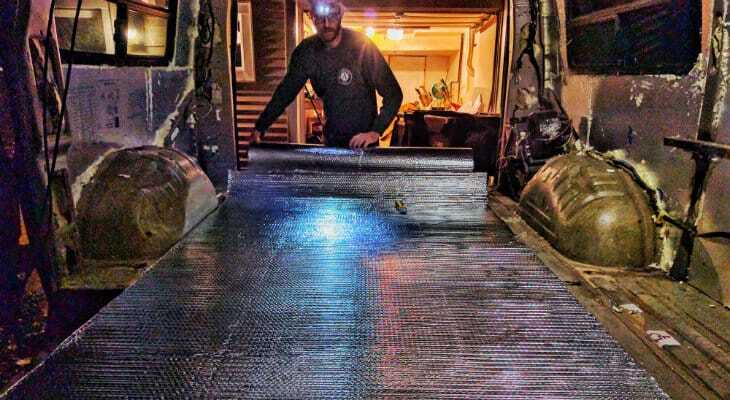 We used the 3/4” Polyisio foil-faced sheets to insulate the walls and ceiling of our van, and we hung it with the foil side facing inward to act as a slight radiant heat barrier. We thought this would be a huge pain because of all the weird shapes in our van, but luckily the internet came to the rescue. Fellow “van lifer” IntoTheMystery13 (check out his awesome Youtube channel) gave us the idea to cut cardboard templates for each section and trace that onto the Polyisio. A good friend of ours dropped off a bunch of extra large cardboard pieces (thanks, Ed!) to make the templates, and we were rolling. We started by roughly measuring each section and drawing these measurements onto the cardboard. We then cut out the templates, put them in place and cut them down until they fit perfectly. 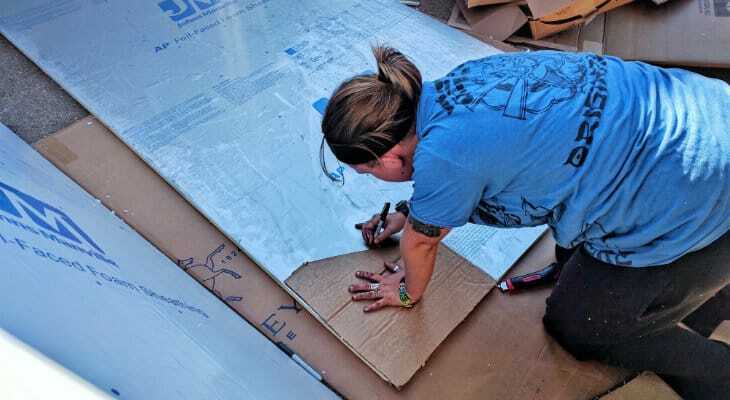 Once we were ready to move forward with cutting the actual sheets of insulation, we just laid the templates on top of the Polyisio, traced the outline with a Sharpie, and cut it out with a box cutter. Some of the pieces fit perfectly snug right away and stayed up on their own and others needed to be trimmed down to fit. Finally, we made sure each piece stayed where we put it by spraying it with 3M High Strength 90 adhesive before sticking it to the wall. We did have a couple pieces give us some trouble, so we stuck those up with Gorilla tape. Before we started insulating the ceiling, we had some thinking ahead to do. The topper on our van is curvy with ridges, and is made almost entirely out of fiberglass. We eventually want to hang a wooden ceiling, and we needed some way to attach this to the topper. 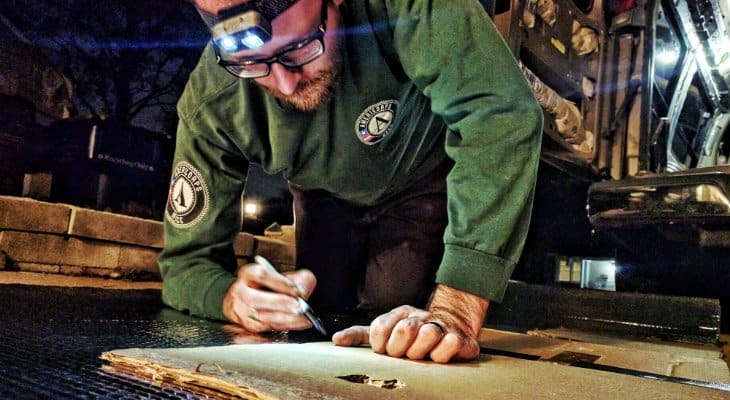 We measured the width of the flat center part of the topper and cut 1×2″ “studs,” which we attached to the roof by screwing into the plywood bracing that runs from back to front within the fiberglass. When it’s time to hang the ceiling, we’ll screw it onto these studs. To hang the Polyisio on the ceiling, we used the same process as we did for the walls: make cardboard templates, trace them on the insulation sheets, cut them out, and hang them in place. 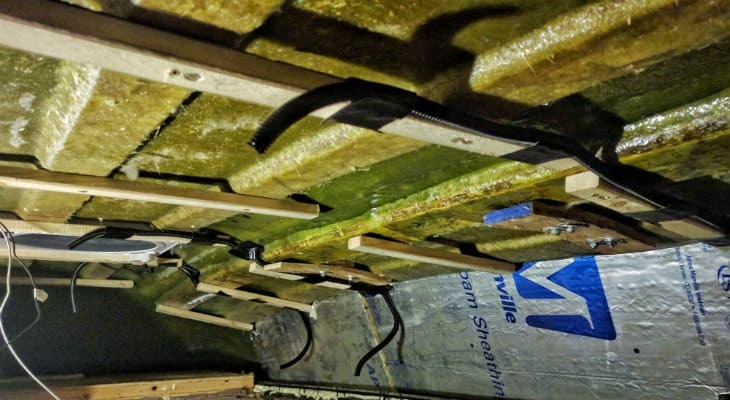 To hang the insulation to the ceiling, we used strips of 3M VHB tape instead of the spray adhesive, and also used some Gorilla tape for particularly stubborn areas. The 3M VHB Tape is some SERIOUS tape! It’s the same sort of tape they use to hang windows in skyscrapers, so you know — pretty strong! Many vanlifers use ONLY this stuff to attach solar panels to their van roofs! After we were finished hanging most of the insulation, we went around filling any gaps. For the bigger gaps we cut strips of Polyisio. For smaller cracks or harder to reach spots, we used Great Stuff Gaps & Cracks spray foam. This stuff expands like crazy, so after it dried we had to go around with box cutters and shave off the excess so the walls and ceiling would have a flat, smooth surface. Make Sure to Think About Wiring! We plan on having LED lights and a vent fan in the ceiling, as well as outlets in the walls. One of the next steps would be wiring and putting up the walls/ceiling, so we taped some conduit to parts of the ceiling where we plan to run wiring to our lights, etc. This way we have somewhere to run the wiring behind the walls/ceiling. It pays to think ahead at every step of a van build! We used Reflectix to insulate the floor. The R-value of Reflectix isn’t the greatest, but it’s better than nothing and it doesn’t cut much height out of the van. This was a pretty simple process. We unrolled a large piece from the front of the van all the way to the back and cut it to the shape of the rear of the van. This took care of most of the floor, except for the weird-shaped sections around the wheel wells. We made cardboard templates for remaining sections and cut the Reflectix to fit. 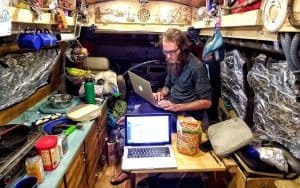 Van Build Tip: Keep all your templates! We used these same templates to cut the subfloor and laminate flooring to shape. We used 3M High Strength 90 to hold the Reflectix down to the floor, and put Gorilla tape over the seams between the different pieces. We also covered the wheel wells and fuel pipe with Reflectix. A Nice and Toasty Van! The further we got on the insulation, the more we could actually feel the temperature difference. 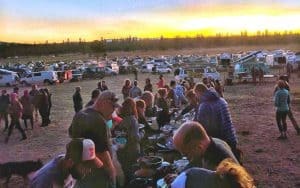 We were getting into the cooler weather of late October/early November, so it was pretty exciting and a great feeling of accomplishment being able to get into the van and take off our jackets due to the warmth. Our van is now fully insulated and we’re looking forward to seeing the rest of it come together. We can’t wait to share the rest of our van build. Thanks again for all the love and support and don’t forget to follow us on Instagram: @gnomad_home and on Facebook at: Gnomad Home. Thank you for the step-by-step guide and the awesome collection of photos along the way. 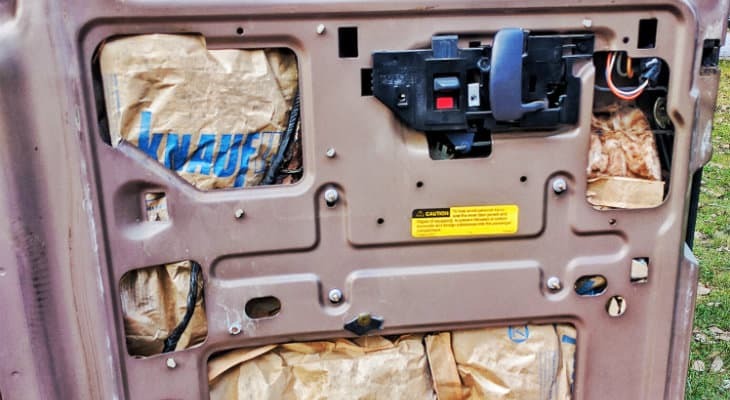 Do you have an estimate as to what insulating your van costs? Hi David, glad you enjoyed the guide! 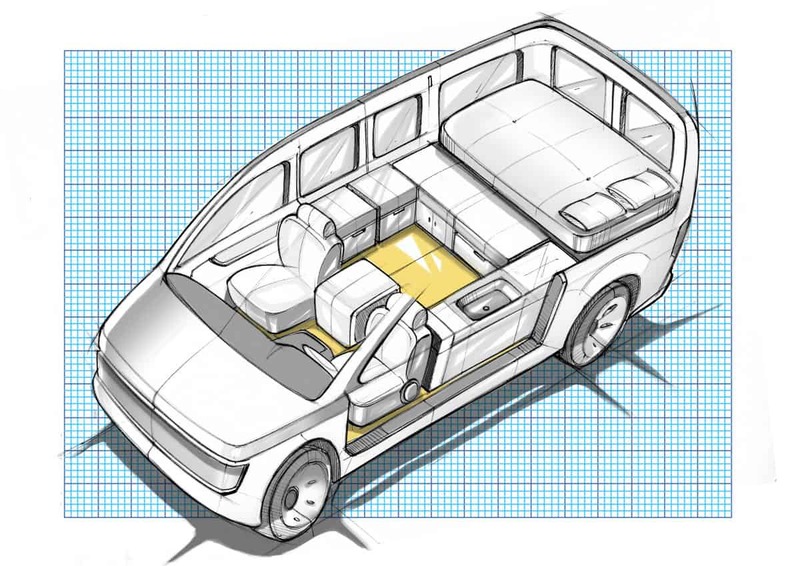 We’re coming out with an even more detailed post on all aspects of van insulation soon, so stay tuned. As far as costs, we spent about $150 on the insulation (2 sheets of 3/4″ polyiso, 4 cans of spray foam, 1 roll of fiberglass, 1 roll of reflectix, and 2 cans of spray adhesive). In addition to that, we also made reflective insulating curtains that probably cost another $120 or so in materials. Costs can differ from van to van depending on square footage, amount of windows, etc. I hope that helps! Awesome, thank you for the quick reply! 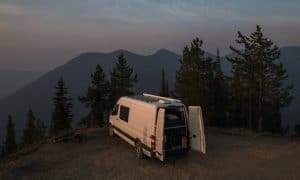 Van insulation has got to be the most controversial and confusing topic in the vanlife world; I appreciate how detailed you guys are with everything. We have windows nearly all the way around our van and I was considering permanently blocking/insulating a few of the rear windows that wrap around our bed in order to keep our sleeping quarters cozy. Is this necessary? And if so, how would your recommend insulating them? 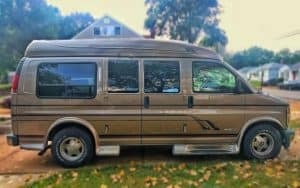 We are in the process of planning out our van build to begin early next month and so far this site has been extremely helpful! My biggest question is where to start? Are solar panels and ventilation the first step or insulation? Any feedback would help! Also living on the road, how do you go about online ordering things with shipping and all? Thanks! Look forward to starting our own journey! I just wanted to say, thank you so much for this information on the reflectix! I was actually trying to think of a better way NOT to have a gap because I’ve seen so much where they just sandwich it in. You saved me a lot of trouble and heat.